(Photo: © Peter Kenny)U.S. Ambassador to the United Nations in New York, Nikki Haley, speaks in Geneva, Switzerland on June 6, 2017. The leader of Egypt's Coptic Church Pope Tawadros II has cancelled a meeting with U.S. Vice President Mike Pence later in December, protesting Washington's move to declare Jerusalem as Israel's capital. The move by Tawadros on Dec. 9 came a day after Palestinian leaders also said that Pence, who is scheduled to visit the region later this month, was not welcome in territories occupied territories by Israel, Al Jazeera reported. In a statement, the Coptic Orthodox Church of Egypt said it "excused itself from hosting" Pence when he visits the Egyptian capital of Cairo on Dec. 20. It said Trump's decision "did not take into account the feelings of millions of Arab people." U.S. President Donald Trump on Dec. 6 formally recognized Jerusalem as the capital of Israel and said he would start the process of moving its embassy there from Tel Aviv, , a move that has been delayed by multiple presidents, both Democrats and Republicans. Two days later the grand imam of Cairo's Al-Azhar Mosque Sheikh Ahmed al-Tayeb also said that he would not meet Pence, Middle East Monitor reported. Al-Tayeb had rejected a request from the United States for Pence to meet him on Dec. 20 at Al-Azhar saying Trump must reverse his decision on Jerusalem. The U.S. ambassador to the United Nations , Nikki Haley, defended President Trump's decision to declare Jerusalem as the capital of Israel, saying time will show it was the right decision while appearing on CNN's Sunday show, "State of the Union." 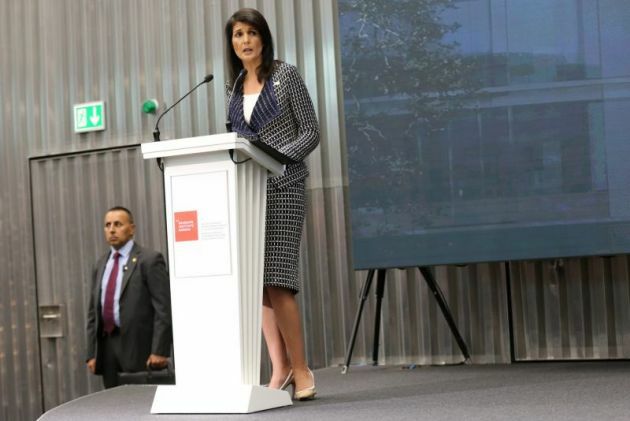 Haley said the move helps "move the ball" on peace negotiations in the Middle East, despite negative reaction in the region to the announcement. "When you make a decision you're going to have some that see it negatively and some that see it positively. But I strongly believe this is going to move the ball forward for the peace process," she said. Haley said Trump "just took Jerusalem off the table" as a factor in ongoing negotiations between Israeli and Palestinian leaders. Those two groups can now discuss borders and boundaries, she said. "For those who want to say this is a bad idea, I'll tell you ask us five and 10 years from now if you still think it's a bad idea because I really do think that this is going to move the ball in the peace process," Haley said, without spelling out how when pressed by interviewer Jake Tapper. "And what this does is just say what's real: Jerusalem is the capital of Israel. What's wrong with saying it?"